Contents and Media: One decal sheet (200mm X 140mm) with markings for five aircraft and an A5 sized card instruction booklet, all in a zip-lock plastic bag. Recommendation: Bravo you fellows at Empire City Decals and thank you for producing something out of the ordinary! 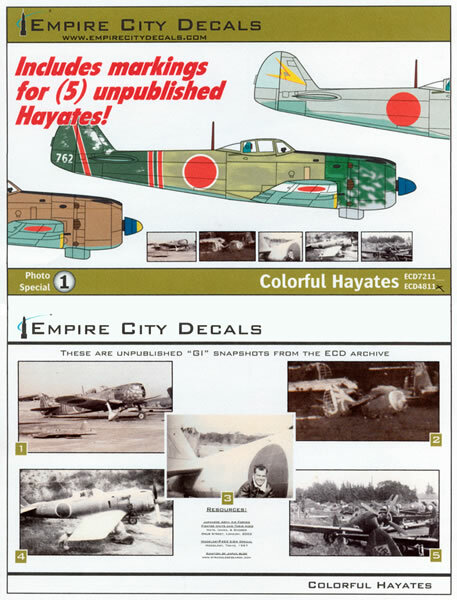 Colorful Hayates is a new sheet from the New York City based Empire City Decals. 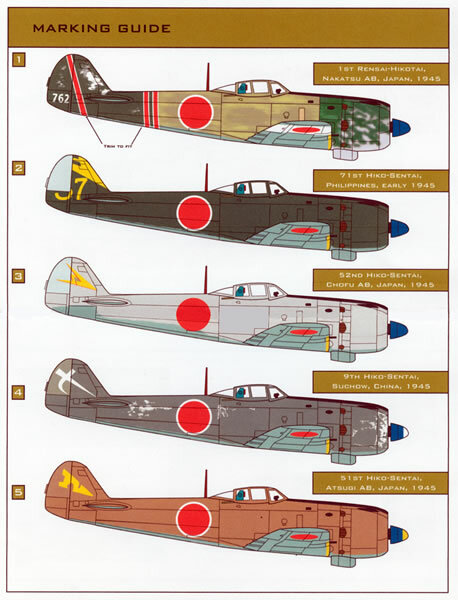 The sheet provides markings for five Nakajima Ki-84 Hayates of the Imperial Japanese Army Air Force in World War Two. 1st Rensai-Hikotai at Nakatsu Air Base, Japan in 1945. The machine is finished in a heavily weathered very unusual finish comprising three distinct segments. The fuselage centre section is in a patchy light olive green, the forward fuselage and cowling is in a darker green mottling over natural metal whilst the rear fuselage is in a darker green with natural metal showing through. The wing sports white home defence bands. Spinner is in mid blue. Unit markings comprise white edged red bands around the rear fuselage and across the fin and rudder. 71st Hiko-Sentai in the Philippines early 1945. Finished in dark green upper surfaces over light grey undersides wit a mid blue spinner. Unit markings appear to be some form of a stylised marking in yellow with yellow numerals 3 or 6 and a 7. 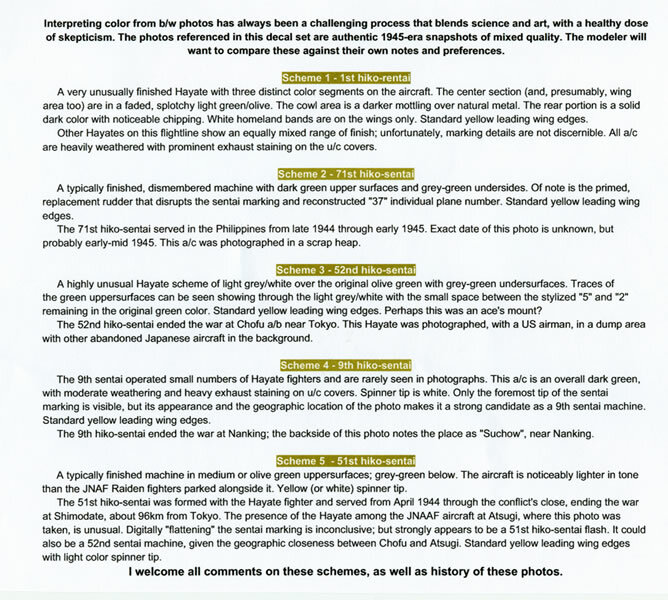 The reference picture of the aircraft shows it to be just a rear fuselage and horizontal stabilisers less their fabric covering, hence the uncertainty of its markings. 52nd Hiko-Sentai at Chofu Air Base, Japan in 1945. Finished in an unusual scheme of light grey over a green-grey underside. It sports a mid blue spinner as well as a yellow and red unit marking on the fin and rudder. 9th Hiko-Sentai at Suchow China in 1945. The machine is in weathered dark green over grey green camouflage with a white tipped mid blue spinner. White unit marking on the fin and rudder. 51st Hiko-Sentai and found at Atsugi Air Base in Japan in 1945. The aircraft is finished in medium green upper surfaces over grey green undersides (although the illustration on the placement guide shows the upper surfaces to be a light tan colour). The spinner is in mid blue with a yellow (or white) tip. Unit marking on the fin and rudder is in yellow. The decals themselves are silk screen printed by AviPrint in the Czech Republic. They are thin, sharp and in perfect register with an absolute minimum of carrier film surrounding each subject. As with other Empire City sheets, no stencil data at all is provided. The placement guide is thin card and A-4 in size. It shows right hand side colour profiles of each option as well as black and white photos of each of the options. A written description of each option is provided on a separate smaller sheet. The decal sheet, placement/information support guide come packed in a clear plastic zip-loc bag. Fans of World War Two Imperial Japanese Army Air Force would know what is out there with regard to known schemes for the Ki-84 and will welcome this new sheet as it provides previously “unpublished” markings. 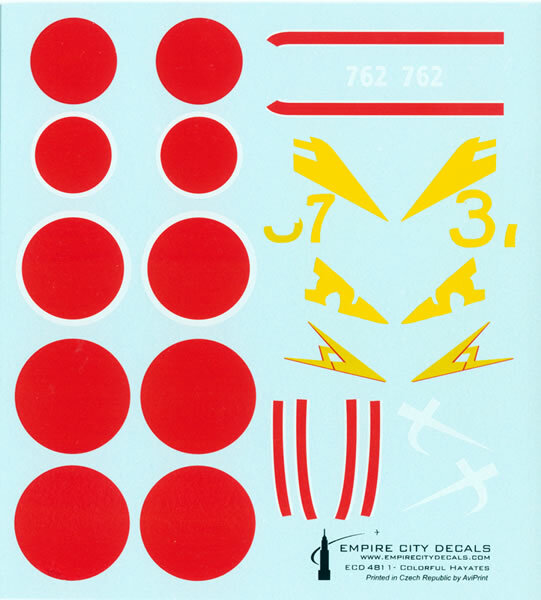 With regard to whether they are correct or not Empire City Decals have included the following disclaimer in bold typeface at the top of the second information sheet “Interpreting color from black and white photos has always been a challenging process that blends science and art with a healthy dose of scepticism. The photos referenced in this decal sheet are authentic 1945-era snapshots of mixed quality. The modeller will want to compare these against their own notes and preferences.” Bravo you fellows at Empire City Decals and thank you for producing something out of the ordinary! For the fans of 1/72 scale, the sheet is also available as ECD7211. Fans of 1/32 scale miss out!